Looks like we’ll never have to hear that annoying, ‘Will Jon Fitch (Pictured) ever fight teammate Josh Koscheck?’ question anymore. According to MMAFighting, the UFC has released Fitch and his respectable 24-5-1 (1 NC) professional record. Fitch won’t be the only Octagon star headed to the unemployment line. The former welterweight top contender will be joined by 15 other fighters. The website reported Jacob Volkmann, Wagner Prado, Mike Russow, Vladimir Matyushenko, Che Mills, Jay Hieron, Terry Etim, Paul Sass, Jorge Santiago, Mike Stumpf, Simeon Thoresen, C.J. Keith, Motonobu Tezuka, Josh Grispi and Ulysses Gomez were all cut by the planet’s premier mixed martial arts promotion. Everyone listed above is coming off at least one loss. Of all the athletes let go in this firing spree – which we’re hearing is only just the beginning, as the organization could be trimming their roster by at least another 80 fighters – Fitch is by far the most surprising. While the 34-year-old has gone just 1-2-1 over his past four outings, the veteran is still considered to be one of the world’s top 170-pounders. According to the Fighter Rankings the UFC just implemented, Fitch exits stage left as the company’s 9th best welterweight. Perhaps that video game dispute he had with the UFC in November 2008 is still fresh in Dana White’s memory bank? 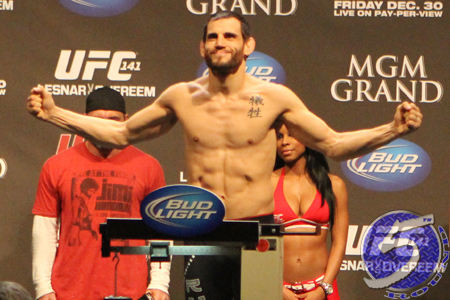 Fitch was last seen dropping a lopsided unanimous decision to Demian Maia at UFC 156.